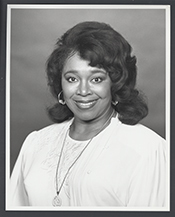 COLLINS, Barbara-Rose, a Representative from Michigan; born in Detroit, Mich., April 13, 1939; graduated from public schools and attended Wayne State University; member, Detroit Region I public school board, 1971-1973; member, Michigan house of representatives, 1975-1981; member, Detroit city council, 1982-1991, 2002-present; unsuccessful candidate for nomination to the One Hundred First Congress in 1988; elected as a Democrat to the One Hundred Second and to the two succeeding Congresses (January 3, 1991-January 3, 1997); was an unsuccessful candidate for renomination to the One Hundred Fifth Congress. Barbara-Rose Collins in Black Americans in Congress, 1870-2007. Prepared under the direction of the Committee on House Administration by the Office of History & Preservation, U. S. House of Representatives. Washington: Government Printing Office, 2006.